Christmas according to Nic Starr | Books After Dark. Continuing my series of interviews, today I’m talking to Nic Starr! I’m excited about this for a lot of reasons, one of which is that Nic is also from the Southern Hemisphere like me, and has written a Christmas Story, The Proof is in the Pudding. Hello, Nic! How’s things in Australia? Nic: Hi Gillian, thanks for having me! We’re just about to go into summer here so the weather is definitely warming up. It’s going to be 39 Celsius today (I think that’s about 102F) so getting hot. Our shopping centres have been decorated for Christmas, and my kids are getting ready for their long summer break – only two more days of school. So I’m planning for a busy couple of months. We’re both used to a warmer Christmas than most of the readers of our books. Does The Proof is in the Pudding reflect that or did you choose to explore Christmas Northern Hemisphere style? If yes, have you ever had a winter Christmas? Nic: My story takes place in a rural setting about 2 hours outside of Sydney. A group of guys head off for an ‘orphan’s Christmas’. I don’t know if that term is common all over the world, but it’s basically where people without close family get together at Christmas. I enjoyed the opportunity of setting a holiday story in Australia and giving readers a small taste of what Christmas can mean for us. What is your typical Christmas (if there is such a thing) like? Nic: We’re pretty traditional. Christmas is about family and food, and we alternate each year with what family we spend the day with – mine or my husband’s. My siblings do the same so that guarantees every second year we’re all together. Christmas Day is spent watching the kids opening their presents, lots of fun in the kitchen preparing way too much food, a sit down lunch with all the trimmings and lots of wine, followed by swimming/sleeping/reading. Then we do it all over again in the evening, this time eating leftovers. The Proof is in the Pudding features a ‘misadventure with a Christmas pudding.’ I am intrigued. Have you ever experienced a Christmas misadventure and did it inspire or influence this story? Nic: Haha. So glad you asked. J The story was inspired by one of the first Christmas’ my husband spent with my family. We travelled to my grandparent’s in the country and hubby (my boyfriend at the time) came with us. All the grownup grandkids and our partners were staying in the local pub, but we gathered at Nana’s for meals. I was in charge of the Christmas pudding, something I’d done many times. I make a proper traditional pudding wrapped in muslin that needs to simmer for hours. It’s then reheated in boiling water on Christmas Day. Do you actually like Christmas pudding? Is there a food that equals Christmas to you? As an Australian resident, what is your opinion on New Zealand’s flag referendum? Nic: Can I admit to knowing nothing about it? *runs off to check Google* Actually I don’t have time to do that right now, but I can tell you my first thought if someone proposed changing the Australian flag – No. Without going into any deep political assessment, it’s the flag I’ve grown up with, the flag my family members fought under when they went to war, the flag that makes me emotional, and makes me think of Australia as soon as I see it. Perhaps if I saw the argument for the other side, it may convince me change my mind. But my gut likes what we have. Bad news! While delivering presents to you , Santa and Rudolph got a bit too much sun and need to lie down to recover. Luckily, you can pick any character from any of your stories to help you! First, you need someone to take Rudolph’s place at the front of the line. Who would you give this job to and why? Going up and down chimneys and delivering the presents requires a lot of dexterity and stamina! Who would you delegate this incredibly important task to? Nic: I think his honour should go to Tanner from Andrew’s Promise. Tanner is ex-army and a firefighter so has had lots of practice. He’s fit and slim so he’d fit in the chimney. Who has the organizational skills to keep nice list, naughty list, and presents straight? Nic: Scott from More Than a Friend is the 2IC at a catering firm (Poppy’s Pantry). He’s great at organization and always makes lists. He doesn’t like to rely on technology thought so he’d have to carry around his notebook all the time. It gets very cold flying through the night sky in that sleigh! Who has the very important job of keeping you warm? Nic: My hubby is going to keep me wrapped up in a snuggly blanket. He’s also going to bring me lots of hot drinks to keep me warm. He’s also an excellent foot massager so if my tootsies get too cold, he’ll be able to warm them up. If my hubby isn’t available then Andrew from Andrew’s Promise would do the job. He has a protective instinct a mile wide so I wouldn’t even need to ask. Finally, someone has to entertain the family, keep an eye on Santa and Rudolph and make sure Christmas in the Starr household goes smoothly. Which character would you trust with this job? Nic: Entertainment is going to be a joint job between Rob from More Than a Superstar, and Adam from my upcoming story called Rustic Melody. Rob’s in a band (the Bad Boys) so he’s a natural born entertainer. Adam loves to sing and play his guitar. He’ll get everyone up and singing along with him. Which of your characters is definitely on the naughty list? Now that you’ve saved Christmas, what is next on the horizon? Do you have any writing plans for 2016? Nic: I have big plans for 2016. The year kicks off with the release of my Rustic series – 3 books set in country Australia. Rustic Melody is the first story and will come out in January. I’m also writing the 3rd story in my Heroes series, Patrick’s Savior, and the 3rd book in my More Than series, More Than Money, which is Jamie’s story. There are a couple of standalone novels in the works and also a paranormal trilogy. So a busy year ahead! How can readers keep up with you? Nic: I love to hear from readers. I can be emailed at nicstar000@gmail.com and I’m on most social media platforms. Thanks so much, Nic! The Proof is in the Pudding sounds like a lot of fun. I’m not a huge pudding fan, but you might have changed my mind. Nic: Thank you for having me. The questions were a blast! J I hope you enjoy pudding this year. Steve Hayes is away with a group of friends who are spending the Christmas break together. He’s determined to put his two-timing ex-boyfriend in the past, and enjoy his week away. Steve is happily surprised to find that Corey Oh, the guy he’s been admiring from afar, has been invited along too. But Steve knows there’s no way someone as wonderful as Corey, who could have any man he wanted, would be interested in him. However, thanks to a misadventure with a Christmas pudding, Steve will find that dreams can come true. When not writing or reading, she loves to spend time with her family-an understanding husband and two beautiful daughters-and is often found indulging in her love of cooking and planning her dream home in the country. You can find Nic on Facebook, Twitter and her blog. She’d love it if you stopped by to say hi. 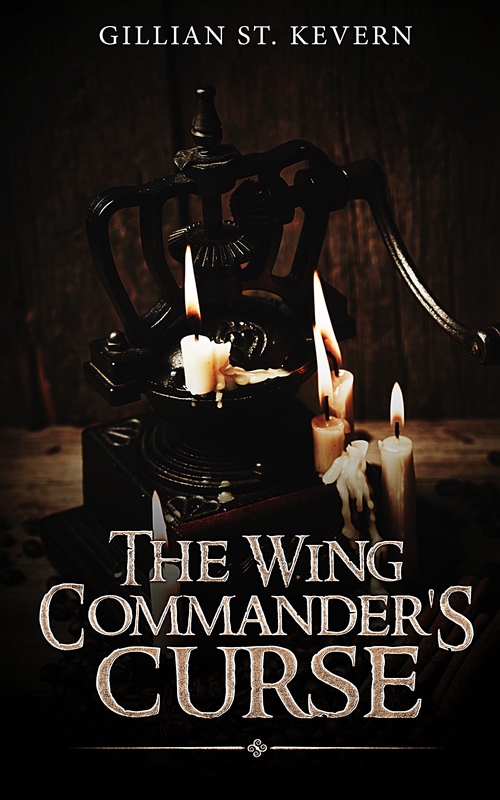 Sign up to my newsletter for new releases, exclusive previews, and a free e-book, The Wing Commander’s Curse!